This article is about intercity bus travel. For Chinese-owned intracity public transit, see Dollar vans in the New York metropolitan area § Chinatown vans. Passengers waiting at the now defunct Fung Wah Lines ticket window on Canal Street and the Bowery in Manhattan's Chinatown. Chinatown bus lines are discount intercity bus services, often run by Chinese Americans and Chinese Canadians, that have been established primarily in the Chinatown communities of the East Coast of the United States and Central Canada since 1998, although similar services have cropped up on the West Coast. They operate in 24 U.S. states and 3 Canadian provinces. The vast majority of Chinatown bus lines are based out of the Northeast U.S.. The buses have been subject to controversy because of safety issues, with several fatal incidents having happened over the years. Some companies have been shut down either temporarily or permanently by regulatory authorities, while others continue to operate subject to increased safety checks. The low-overhead, low-fare services have been popular, helping to drive down the prices of competing services such as Greyhound, Megabus and BoltBus. Eastern Shuttle MCI 102DL3 coach boarding customers in Chinatown, Manhattan. Double Happiness #222 at Herald Square. The fleet used by various Chinabus companies can vary greatly from new coaches to older, pre-owned coaches, and with a few notable exceptions such as Eastern Shuttle and routes to Boston, not all units are branded with the operator name other than required USDOT markings. With the exception of Eastern Shuttle and services to Boston (all of which use clearly marked buses), many Chinatown bus companies use wet leases to provide overflow capacity during the weekend. Some smaller companies use wet leases to provide their core capacity. Typically, a bus (and a driver) would be chartered from a tour bus operator, a practice also used by mainstream companies such as Greyhound Lines during peak service. Bus ticket saleswoman at the corner of East Broadway and Forsyth Street in the Little Fuzhou neighborhood within Manhattan's Chinatown. Besides the routes within the major North Eastern cities, several Chinatown buses have daily routes that run from New York City to Miami. The majority of the trip uses I-95, and the buses stop near major destinations in the Southern United States. A couple of routes also go to Ohio. In order to save time, the buses never go into the city, but instead stop at gas stations and rest stops along I-95. Chinatown buses often go from major cities to casinos. Some 'Casino Buses' use I-395 to make an intermediate stop at Foxwoods Resort Casino between the Massachusetts Turnpike and I-95. [ citation needed] An example of this can also be found in the Southern United States where tour companies offer bus services from Houston's Chinatown to Lake Charles area casinos. In Canada, 'Casino Buses' are offered between Toronto and Niagara Falls, Ontario. Passengers waiting to board the Lucky Star-Travel Pack bus in Manhattan, departing for Boston. ^ Austen, Ben (April 7, 2011). "The Megabus Effect". Bloomberg BusinessWeek. Retrieved May 17, 2013. ^ a b c d e f g h i Nicholas J. Klein; Andrew Zitcer. "Everything but the Chickens" (PDF). Edward J. Bloustein School of Planning and Public Policy. Retrieved October 30, 2015. ^ a b c d e f g h "The Amazing Chinatown Bus Network". Motherboard. November 27, 2014. Retrieved October 30, 2015. ^ a b c Klein, Nicholas (2009). "Emergent Curbside Intercity Bus Industry". Transportation Research Record: Journal of the Transportation Research Board. 2111: 83–89. doi: 10.3141/2111-11. ^ a b Carpenter, Mackenzie (August 16, 2006). "'Chinatown bus services' have grown quickly since 1998". Pittsburgh Post-Gazette. ^ a b c d e f g h i j k "Chinatown Bus Study" (PDF). New York City Department of Transportation. October 2009. Retrieved October 29, 2015. ^ a b c d e f g h i j Nanos, Janelle (May 28, 2007). "Penny-Pinching Peril". NYMag.com. Retrieved October 29, 2015. ^ a b c d Luo, Michael (February 21, 2004). "In Chinatown, a $10 Trip Means War; Weary Owners Struggle to Stay Afloat in Cutthroat Competition". New York Times. Retrieved April 17, 2014. ^ a b c d e Wilson, Michael (October 7, 2011). "Crime Scene: Collateral Damage in the Chinatown Bus Wars". The New York Times. Retrieved October 8, 2011. ^ a b c "Chinatown Buses: A History". Axis Chemicals. December 23, 2013. Retrieved October 30, 2015. ^ a b Schliefer, Theodore (August 8, 2013). "Bus travel is picking up, aided by discount operators". Philadelphia Inquirer. Retrieved August 25, 2013. ^ a b c d e f Epstein, Jim (November 2, 2013). "The Government's Cheap, Dishonest Campaign Against the Chinatown Bus Industry". The Daily Beast. Retrieved October 30, 2015. 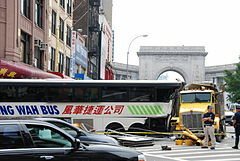 ^ a b c d e f "Chinatown's bus war turning fatal". The Washington Times. March 7, 2004. Retrieved October 30, 2015. ^ Gerson, Daniela (February 14, 2006). "If You Want To Vamoose in DeLuxe Style, You're in Luck". The New York Sun. ^ Brulliard, Karin (November 24, 2006). "For Many Asians, an Atlantic City Pilgrimage". The Washington Post. ^ a b Bailey, Steven (June 18, 2004). "Peter Pan is a bully". Boston Globe. ^ a b Starcic, Janna (June 1, 2005). "Surviving the Motorcoach Rate-Cutting War". Metro Magazine. Retrieved October 30, 2015. ^ Harlan, Heather (September 12, 2003). "Arsons May Signal Escalating NYC Shuttle Bus Feud". AsianWeek. Archived from the original on April 4, 2013. Retrieved January 24, 2007. ^ McPhee, Michelle; Alice McQuillan (January 19, 2004). "Chinatown barrage stumps cops". Daily News. New York. Archived from the original on September 12, 2005. Retrieved January 24, 2007. ^ "Feds' kung pow!". New York Post. October 23, 2008. Retrieved October 28, 2008. ^ "Photos: Largest Gun Seizure In NYC History Involves Chinatown Buses, Stop & Frisk". Gothamist. August 19, 2013. Archived from the original on October 31, 2015. Retrieved October 30, 2015. ^ a b c d e f g h "All Aboard, Next Stop Chinatown". Hyphen Magazine. August 1, 2007. Retrieved October 31, 2015. ^ a b "Columbia Spectator". Columbia Daily Spectator. February 27, 2004. Retrieved October 30, 2015. ^ Clark, Patrick (July 17, 2014). "How Chinatown Buses Survived Competition, Regulation, and the Occasional Gang War". Businessweek.com. Retrieved October 30, 2015. ^ Knafo, Saki (June 8, 2008). "Dreams and Desperation on Forsyth Street". The New York Times. Retrieved September 2, 2008. ^ Hilgers, Lauren (October 13, 2014). "Chinatown's Kitchen Network". The New Yorker. Retrieved October 30, 2015. ^ John Chin, Executive Director of the Philadelphia Chinatown Development Corporation. Telephone Interview, September 17, 2008. ^ Beehner, Lionel (June 9, 2010). "Chinatown Buses Unveiling New Routes". In Transit Blog. Retrieved October 29, 2015. ^ a b Arino, Lisha (July 16, 2014). "City Will Begin Fining Illegal Chinatown Buses by August". DNAinfo New York. Archived from the original on January 6, 2016. Retrieved October 29, 2015. ^ Taft, Chloe (July 2, 2014). "Ticket to a New York Casino License Is on the Chinatown Bus". The Huffington Post. Retrieved October 30, 2015. ^ El-Ghobashy, Tamer (March 16, 2011). "NYPD Cracks Down on Buses". The Wall Street Journal. Retrieved March 16, 2011. ^ Ellement, John (March 19, 2005). "Passengers Tell of Wild Bus Trip". Boston Globe. Retrieved January 24, 2007. ^ Ross, Casey (August 16, 2005). "Flames engulf Fung Wah bus in Connecticut". Boston Globe. Retrieved January 24, 2007. ^ Cherasore, Paul (January 27 – February 2, 2006). "Day of confusion for Chinatown bus riders". Downtown Express. Retrieved January 24, 2007. ^ "Bus Crash Injures Several, Causes Big Parkway Backups". The Pittsburgh Channel. August 15, 2006. Archived from the original on September 27, 2007. ^ Milan Simonich (August 16, 2006). "10 hurt as tour bus crashes". Pittsburgh Post-Gazette. ^ "34 hurt, driver cited for Fung Wah bus rollover in Auburn". Boston Globe. September 6, 2006. Archived from the original on March 28, 2009. Retrieved January 24, 2007. ^ "Fung Wah bus company fined $31K for rollover". Boston Globe. October 31, 2006. Archived from the original on March 29, 2009. Retrieved January 24, 2007. ^ "Fung Wah Bus Loses Wheels". WCVB-TV. January 3, 2007. Archived from the original on June 13, 2007. ^ "Fung Wah Bus Crashes On Turnpike". WCVB-TV. February 14, 2007. Archived from the original on February 23, 2007. ^ LeBlanc, Steve (September 12, 2006). "Chinatown Bus Line Agrees to Inspections". Fox News Channel. Associated Press. ^ Kim Ring (February 19, 2007). "Passengers OK after bus fire on Turnpike". telegram.com. ^ Ryan, Tim (March 23, 2007). "Fung Wah Bus Involved In Mishap". WCVB-TV. Archived from the original on July 17, 2007. Retrieved March 23, 2007. ^ Armas, Genaro C. (May 20, 2007). "2 Dead, 32 Hurt in Pa. Bus Crash". washingtonpost.com. Retrieved October 30, 2015. ^ Noah Bierman (June 24, 2008). "Boston-bound bus hit by truck in NYC; pedestrian is killed". The Boston Globe. Retrieved June 24, 2008. ^ El-Ghobashy, Tamer (June 25, 2008). "Rig in fatal crash had faulty brakes". Daily News. New York. Archived from the original on June 26, 2008. Retrieved June 25, 2008. ^ Debusmann, Bernd (March 14, 2011). "Bus driver in deadly New York crash faces scrutiny". Reuters. Retrieved April 22, 2011. ^ Paddock, Barry; Nestel, Matthew (March 14, 2011). "Another fatal bus crash, in N.J." NY Daily News. Retrieved October 29, 2015. ^ "2 dead, 48 injured in Delaware bus crash". USA TODAY. September 21, 2014. Retrieved October 29, 2015. ^ O'Leary, Lizzie (September 15, 2005). "Chinatown Buses Seek to Add Safety to Savings". WNYC. Retrieved January 24, 2007. ^ "Gov't cracking down on unsafe bus companies operating along East Coast's I-95 corridor". The Washington Post. May 31, 2012. Retrieved May 31, 2012. ^ "Feds close Fung Wah's doors". March 2, 2013. Retrieved October 29, 2015. ^ Connor Adams Sheets (December 18, 2014). "Fung Wah's Chinatown Buses To Return To Road In 2015". International Business Times. Retrieved December 19, 2014. ^ Chris Fuchs. "Fung Wah Bus Company Shuts Down for Good". NBC News. Retrieved October 29, 2015. ^ "Lucky Star buses will roll once more ". Boston Globe. Retrieved October 29, 2015. Wikimedia Commons has media related to Chinatown bus lines. Klein, Nicholas J. (2009). "Emergent Curbside Intercity Bus Industry" (PDF). Transportation Research Record: Journal of the Transportation Research Board. 2111 (1): 83–89. doi: 10.3141/2111-11. Retrieved May 10, 2015. Brief History of Chinatown Bus, Gotobus, updated in 2011.